Morning: Departs from Mines (Seri Kembangan) at 10am. Noon: Reach Harbor Front, Singapore around 3pm. After that, went to Kay Wey’s house with Foong Yeng to put our stuff. Evening/Night: Went out for dinner. Met with Pick Wan and had steamboat buffet for dinner. Morning: Breakfast at one of the MRT station before going to Bugis Street. Noon: Reach Bugis Street. Budget shopping for the ladies and also for one particular guy. *cough*WC*cough* Lunch at some Thai restaurant. Night: Orchard Road. Spent most of the time cam-whoring. Damn tire that time coz walked a lot that day. Morning: Breakfast at Chinatown aka Niu Che Shui. The girls went for more shopping while me and Soon Tak just walk around. Noon: Vivocity. The girls spent more than 2hours in the Esprit shop! 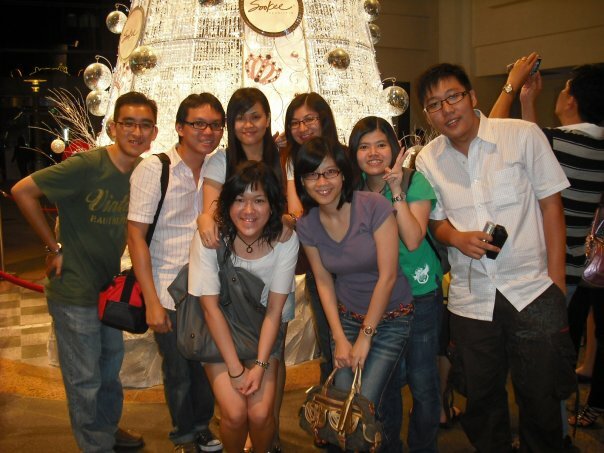 This entry was posted in Friends, Photos, Trip and tagged christmas, singapore on March 16, 2010 by Khim Hoe. This entry was posted in News Comment and tagged miss world singapore, ris low, singapore, woman on September 12, 2009 by Khim Hoe. I guess that this is worst than female Ah Long! Hoi Dei Lau Yue! This entry was posted in News Comment and tagged fierce, singapore, woman, wtf on September 9, 2009 by Khim Hoe.